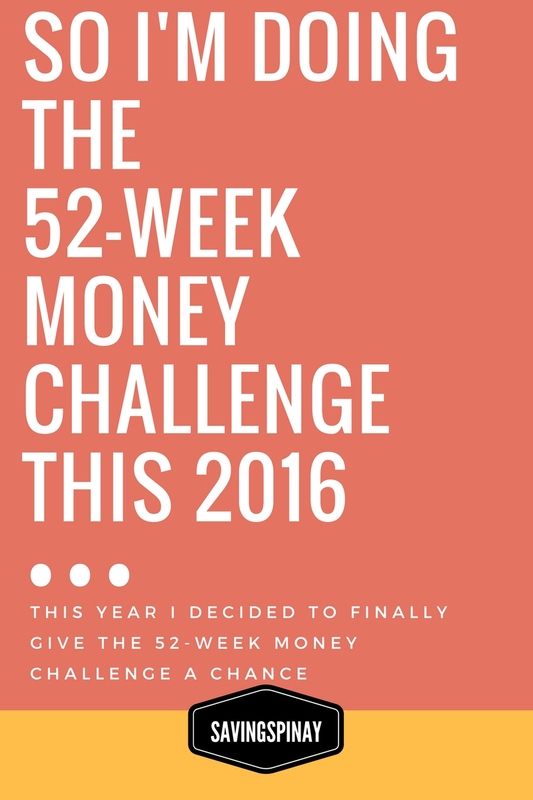 This year I decided to finally give the 52-Week Money Challenge a chance. I remember how everyone went crazy over this saving technique last 2014. Thanks to KuripotPinay, many have finally acted on their saving goals. Some may find the technique a temporary solution. Others even bash the challenge because it means saving all year long just to spend it afterwards. Many on the other hand share the same sentiments with the author. The 52-Week Money Challenge is just a starting point. It gives you a good foundation in making saving a habit. What is this 52-Week Money Challenge? The 52-Week Money Challenge I believe started with Life as You Live It. Kuripot Pinay did the Filipino version and it became really popular in social media and made it even in the national television. A goal. This will keep you motivated to save and save. Simply imagine getting your most coveted gadget by the end of the year. A Piggy Bank. You can use a plastic container, a bottle, a jar of just about anything. This will be called a grownup piggy bank. Template. The challenge has an existing template that we can print out and tape in our piggy bank. However, since the amount is in dollars, I took the liberty to edit the dollar part and translate it into Philippine Peso. Plus, I altered the dollar equivalent to Php50. Below is the 50-pesos interval template created by Ms. Rhea. Here is my 20-pesos interval template. Ever since the challenge came out I knew I wanted to try it. Its nice to practice how compound interest works in an easy and simple saving challenge. My goal for joining the challenge is to welcome 2017 with a reserve money. I know it sounds silly thinking about the end of the year when the New Year has just began but I felt a little sad that I didn’t save that much money in 2015 so I welcomed 2016 with a lot of fear whether I will still have enough cash for the new year. I also wasn’t able to buy gifts to my family members though we dine out and bonded. I have these little regrets that I don’t want to feel towards the end of 2016. So with that in mind I am taking the 52-Week Money Challenge this 2016 as preparation for a greater 2017. I am doing the original 50-pesos interval so I am expecting to save 68,900pesos at the end of the year. My plan is to save the amount as is in an envelope and deposit it at the end of the month. Instead of putting it in a jar I decided its better for me to deposit the money on a bank account. I still have my BPI Save-Up Plus Investment Account where I can change the name of the account to “52-Week Money Challenge” I know the piggy bank is a good idea so you can physically see your money growing but in months time it would be a big amount and I am afraid of things that can happen like akyat-bahay gang or fire. I will also update via the SavingPinay FB Group how my 52-Week Money Challenge is doing so if you are up to the challenge we can be friends there and be accountable with each other. I still have other saving methods for different goals. I’ll talk about my saving goals in another blog post. 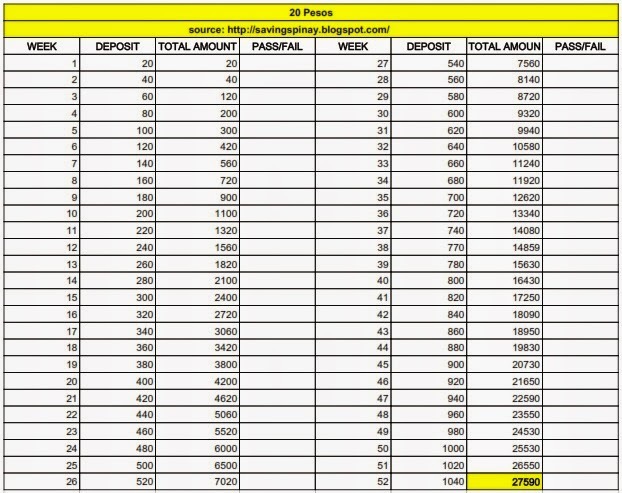 Last March 2015 I made a blog post on the Different ways you can apply the 52-Week Money Challenge in Your Life. Yes, you can use the challenge in other ways as well and not just for the purpose of buying a brand new phone or a brand new laptop. You can use the saving challenge to finally have your Emergency Fund, Wedding Fund, Small Business Fund, Travel Fund and/or a Birthday Fund. You can also alter the template to suit your income and budget. I see the challenge as a good way to start saving money. You’ll learn to commit to a goal, to focus on the value of saving and to know that compound interest actually works. I think it would be a nice addition to a better you in 2016. My tip for you is to ask your boyfriend or your spouse or your best friend to join you. Introduce the challenge to them and if they find it interesting you can have an instant accountability partner. I don’t have a boyfriend so my accountability partners are my SavingsPinay Readers. I hope we can succeed and win this challenge. 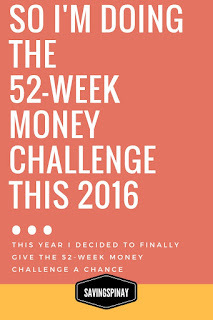 Will you join me in this 52-Week Money Challenge? 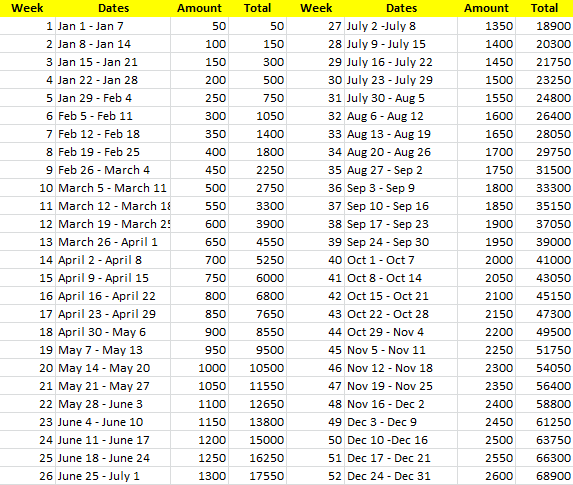 I also have a financial challenge for this year but not a 52-week & not in interval amounts as I find it a little big. Hoping to say enough to prepare for a trip o to buy gifts for Christmas. Hehe.